The weather report today calls for record high temperatures in this part of the world, but I’m not feeling it here. This time of year, even if the afternoon is mild, the sun is stingy with its warmth and it just doesn’t find its way into this old farmhouse. I feel chilled. Deep down. The sky is grey and I’ve got the shivers. Rather than curse the cold, I built a fire. Those of you with wood stoves and fireplaces know that wood fires are a lot of work: stacking and restacking (and restacking) the wood into neat walls; lugging the days’ worth of logs in to the house; carefully coddling the baby fire as you start it; constantly “feeding” the ravenous fire-pet that snacks all day in exchange for the warmth it provides; cleaning up bits of wood all over the floor, and ashes blown out when the stove door opens; humidifying the house to counteract the dry, wood heat; digging paths through the snow to the woodpile. And yet, for all of that, we wouldn’t be without it. 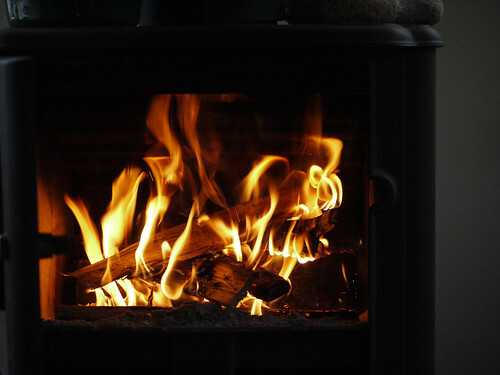 A fire in the wood stove is more than a heat generator. It’s a demanding and yet giving friend. It gives the room a life and a focal point. It lets you stare at its flickering flames and think thoughts that travel far back into human history: home, safety, warmth, food, community. When you’re absolutely frozen, you can walk right up to it and stand in front of the radiating heat, rotating slowly like a bronzing marshmallow. And when you’re comfortably warm, you can take a seat across the room, out of its direct reach, and still enjoy its glow. The other day, a friend and I built a fire for a sick friend who was chilled. Building the fire was an easy chore for us, but something our friend couldn’t do for herself that day. And when we left our friend, the fire stayed, sitting calmly beside her, doing its best to warm her and keep her company even as the afternoon grew dim. Until that day, I’d never thought of a fire as a gift. It turns out it’s one of the gifts I’m most glad to have received, and given.